The InterLab study is a collaborative effort organized by the iGEM Organization Measurement Committee. It aims to improve measurement tools and methods in laboratory work. As many of us who work in the lab know, different laboratories can have very different practices and instruments. This fact makes it very difficult to compare results and repeat measurements between any two laboratories in the world. Repeatability is an essential part of the scientific method, and therefore efforts to enable and improve it are highly valuable. 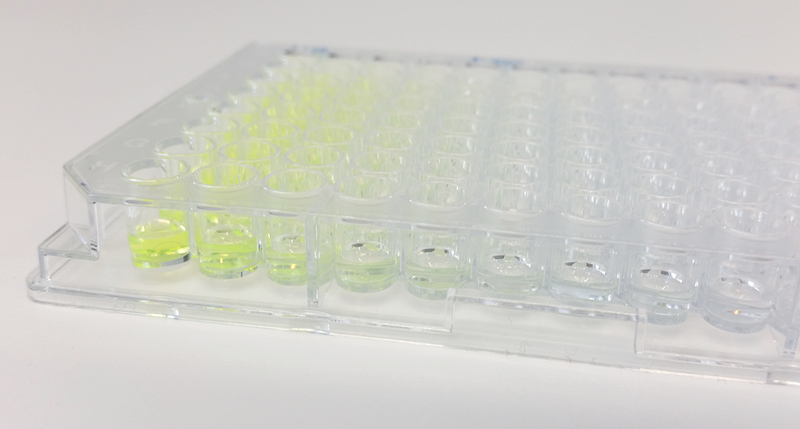 This year, all InterLab participants measured the green fluorescent protein (GFP) fluorescence intensity of 6 BioBrick Parts from the Registry in addition to positive and negative controls. We managed to get results after a bit of struggling with our Plate Reader settings. In our experiments, we used – as was required – Escherichia coli K-12 DH5α cells. We determined the competency of the acquired cell strain with the Competent Cell Test Kit provided by iGEM. The kit contained three vials of purified DNA from BBa_J04450 in the plasmid backbone pSB1C3. There were three different concentrations to test with: 10 pg/µl, 50 pg/µl and 100 pg/µl. Transformations were then performed with all three concentrations. The results can be seen in Table 1 below. Unfortunately, our transformation efficiency was very low, as we could not acquire more competent cells. However, we were still able to get results with our cells. Table 1. Cell competency tests for K-12 DH5α cells. Below you can find a complete list of the test devices as well as the controls which were provided in the Measurement Kit. Each device is in the pSB1C3 plasmid backbone, which has antibiotic resistance against chloramphenicol. Therefore chloramphenicol was used in transformation. All parts were transformed according to the given transformation protocol . Once we got colonies, on the second try, we inoculated two colonies from each plate on LB medium and chloramphenicol. After 16-18 hours of growth, we proceeded to the plate reader measurements. LUDOX-S40 provided in the iGEM Measurement Kit was used as a point reference for transforming absorbance data into standard OD600. Absorbance of LUDOX-S40 and H2O samples was measured at 600 nm with our plate reader according to the given protocol . The results can be seen below in Table 2. Table 2. Absorbance of LUDOX-HS40 and H2O at 600 nm. 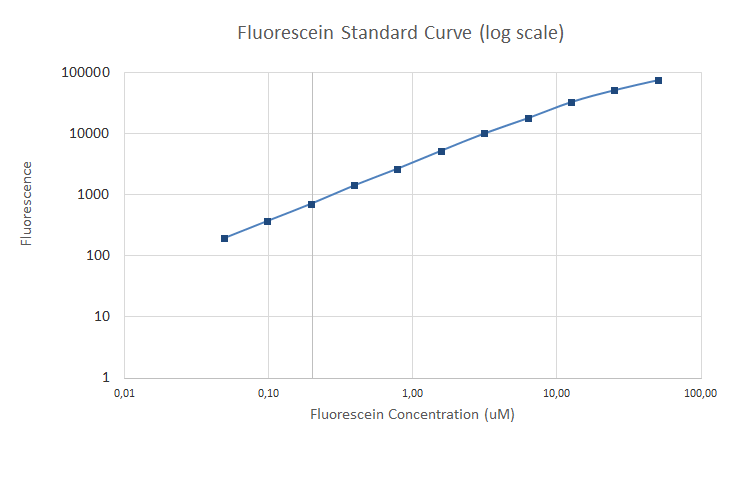 A dilution series of fluorescein was prepared and fluorescence was measured in a 96 well plate according to the given protocol . 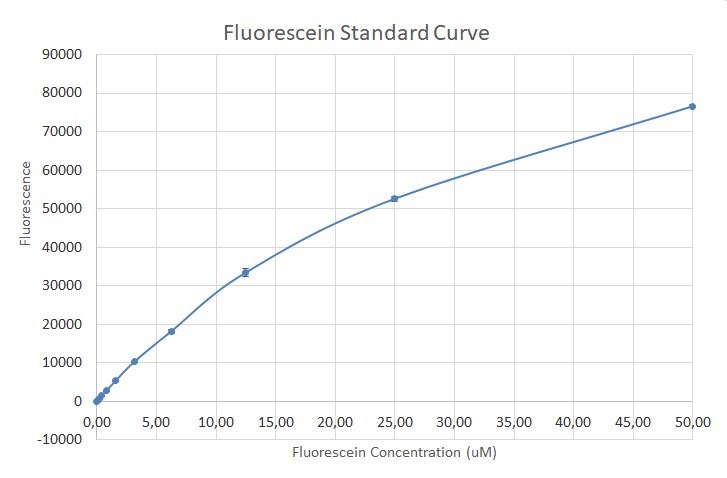 A standard curve was created in order to enable conversion from cell based readings to fluorescein concentration and forward, into GFP concentration. The results can be seen in Figures 1 and 2, in both normal and logarithmic scales. 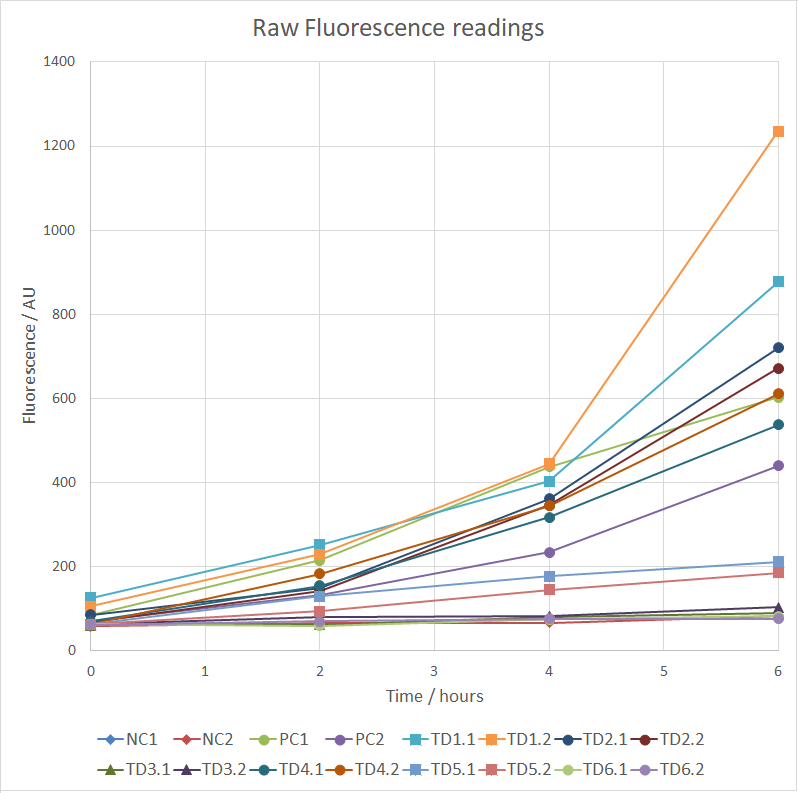 Cell fluorescence was measured according the plate reader protocol  with the same settings as the standard fluorescein curve. 96 well plates were prepared for fluorescence measurement after overnight growth, and then samples of the cultures were taken at time points: 2 hours, 4 hours and 6 hours. The cultures were diluted to a target OD600 of 0.02 before measurement. 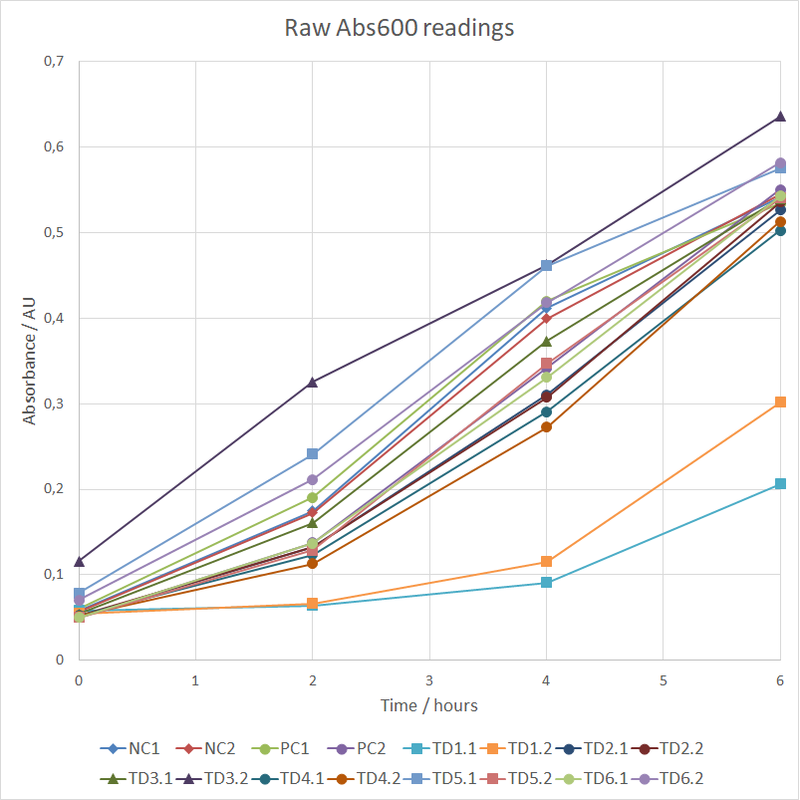 The results of the raw absorbance and fluorescence values at 600 nm for all test devices and controls can be seen in Figures 3 and 4. NC stands for negative control, PC for positive control and TD for test device. The numbers represent colonies 1 and 2 taken from the agar plates with the transformants.